The Pacific coast of Tohoku district has repeatedly suffered from tsunami damage accompanying earthquakes throughout recorded history. This region sustained severe damage also from the tsunami the 2011 off the Pacific coast of Tohoku Earthquake on March 11. 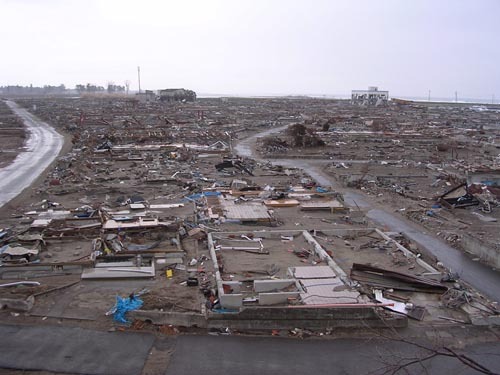 This short article explains the relation between land use and tsunami damage, observing regional characteristics, in the Pacific coast region from Iwate to Fukushima, which experienced the most severe damage in the Tohoku district. Prepared based on the land use refined mesh of the National Land Digital Information. The Pacific coast region in Tohoku district is roughly divisible into three areas: the Sanriku coast area, the Sendai Bay area, and the Hamadori area. Furthermore, the Sanriku coast area is divisible into northern and southern parts based on its geomorphological features. Figure 1 presents a land use map of the Pacific coast region in Tohoku district, which was prepared based on the land use refined mesh (about 100 m × 100 m) of the National Land Digital Information by the Ministry of Land, Infrastructure and Transport. The characteristics of each area are described from the viewpoint of land use, with this figure as a reference. The northern part of the Sanriku coast area has developed coastal terraces and sea cliffs facing the Pacific Ocean. Terraced plains are used mainly for agriculture and stock farming. In contrast, the southern part of the Sanriku coast area comprises typical ria coasts with an intricate coastline, with little plain land except for bay heads. Sanriku offshore is famous as one of the best fishing grounds in the world. Fishing ports are established in bay heads as fishery bases, and manufacturing facilities such as fishery processing are located in the hinterland. The population and economic activity of this area are concentrated into narrow plain lands at bay heads. Alluvial plains formed by stream deposits extend from the Kitakami, Natori, and Abukuma rivers. They are usually used as paddy fields in the Sendai Bay area. Sendai city, located in this area, is the largest city in the Tohoku district. Its urban areas have continued to expand through development since the high economic growth period. However, restriction of diversion by development control from farmland to urban areas leaves broad paddy fields along the shore. Coastal cities such as Ishinomaki and Shiogama have also grown from their origins as historical port towns. In addition, Sendai Port and Sendai Airport have also developed, with industrial areas developing in different locations in the hinterlands. The southern part of this area comprises not only paddy fields but agricultural zones on beach ridges and hills. Horticulture is prosperous in the comparatively warm climates in the Tohoku district. Coastal terraces and narrow lowlands formed by rivers that engrave the terraces are located all along the coast of the Hamadori area, and city centers are located rather more inland. Coastal lowlands are used as paddy fields. Furthermore, many electric power plants were invited as economically stimulative measures in this area, including the Fukushima Daiichi Nuclear Power Plant, which suffered an accident caused by this tsunami. Iwaki, the second largest city in the Tohoku district, is located at the southernmost of the Hamadori area. Iwaki ships industrial products throughout most of the Tohoku district. Industrial areas have been sprung up around Onahama Port and other areas. The tsunami created by the 2011 Tohoku Earthquake ascended inland as far as 8 km from the seashore, flooding 561 km2 of land throughout the Pacific coast region of eastern Japan1). Regional differences are apparent in the extent of flooding by the tsunami. Although the inundation range along the Sanriku coast area was narrow, most of the plain land in the bay heads of a ria coast were flooded, and the tsunami ascended further inland along valleys. In the Sendai Bay area, the ascension distance of tsunami was particularly long and the alluvial plain spreading in front of the seashore was flooded broadly. Lowlands made up along rivers engraving coastal terraces and coastal areas of Iwaki were flooded by tsunami in the Hamadori area. The characteristics of land use of the tsunami inundation range in each area were investigated based on the land use refined mesh of the National Land Digital Information. Figure 2 depicts the area of tsunami inundation range by land use2). The area ratio of ground according to urban land use shows a prevalence of building lots and public facilities within the inundation range. That ratio is as high as about 60% in the Sanriku coast area. The area is particularly large in the southern part of the Sanriku coast area. The land use characteristics of this area lies in the background, in which built-up zones concentrate on the narrow plain land of ria coast bay heads, which are easily affected by tsunami damage. A wide range of built-up zones was flooded also in the Sendai Bay area. Particularly in Ishinomaki, where a built-up zone had formed in front of Sendai Bay, about 45% of such built-up zones were inundated. Sendai Port, Sendai Airport, and industrial areas that had developed along Sendai Bay were also submerged. This tsunami had so great an ascension distance that even urban zones that were located rather inland were flooded. In the Sendai Bay area, farmland was flooded broadly, which was particularly remarkable at the southern part of this area. The Hamadori area also has a high area ratio of farmland in the inundation range, where paddy fields in the lowlands in front of Pacific Ocean were submerged. Industrial areas that had developed along the shore and building lots in Iwaki were flooded mainly in built-up zones in the Hamadori area. Figure 3 presents a comparison between flooded and not flooded areas within urban areas and farmlands in each area, which confirms the trend described above. With respect to urban districts, around 30% of building lots are submerged in the southern part of the Sanriku coast area and the Sendai Bay area. Other ground for urban land use was also widely flooded in the Sendai Bay area. Regarding farmland, paddy fields were severely inundated in the Sendai Bay area and the Hamadori area, 40% and slightly less than 20%, thereof 30% of other farmland (mainly fields and orchards) was also flooded in the Sendai Bay area. April 29, 2011, Taken by the Author. Houses that suffered damage causing their complete or partial collapse by the 2011 Tohoku Earthquake reached 115,000 throughout the country3), 80% of which were situated along the Pacific coast of the Tohoku district, from the Sanriku coast area through the Sendai Bay area to the Hamadori area, which suggests the tremendous magnitude of tsunami damage. Particularly, 30% of total or partial collapse damage took place in the southern part of the Sanriku coast area, while slightly more than 40% occurred in the Sendai Bay area. These figures underscore the severity of tsunami damage in each area. Many built-up zones that had developed in the bay head areas were destroyed completely in the southern part of the Sanriku coast area, such as Taro of Miyako, Rikuzentakata in Iwate, Shizugawa of Minamisanriku, and Onagawa in Miyagi. In addition, fishing ports were devastated, with destruction of breakwaters and other works and facilities4). 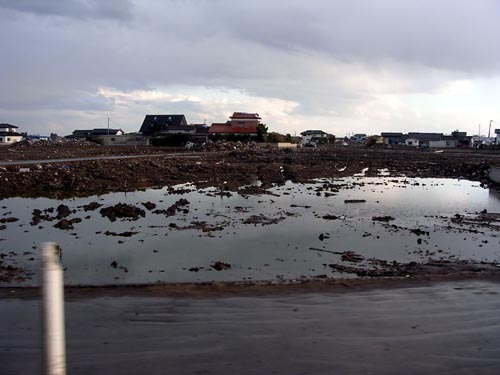 In the Sendai Bay area, destructive damage occurred at the Ishinomaki waterfront and in coastal towns in southern Sendai, such as Arahama in Wakabayashi ward, Sendai and Yuriage in Natori, and others (Photo 1). Sendai Port and Sendai Airport also suffered tsunami damage. Their functional decline was remarkable immediately after the incident. Much of the infrastructure and structures near the shore from the Sendai Bay area to the Hamadori area also sustained tsunami damage. Although such facilities have gradually resumed operations, some operations remain suspended while others have ceased operations entirely. Damage to farmland5) includes increased salinity attributable to seawater flooding as well as the breakdown of agricultural facilities and deposition of rubble and mud. For example, in the Sendai Bay area, salinity of almost 10 times the standard level has been detected in flooded paddy fields. High salinity of farmland might bring adverse effects in raising crops. It is anticipated that salt damage might make rice planting difficult this year in 100 km2 of paddy fields in Miyagi alone6). That area accounts for over 70% of paddy fields flooded in Miyagi, and is equivalent to 14% of rice planting areas cultivated last year. Paddy fields of a comparable area in Fukushima are also regarded as facing difficulties in planting attributable to salt damage and radioactive pollution caused by the Fukushima Daiichi Nuclear Power Plant accident. Draining facilities, which are indispensable for desalinization, were damaged in many farmland areas. Including their repair, several years are assumed to be necessary until desalinization is completed and farmland is recovered. In the southern part of the Sendai Bay area, fields were inundated broadly and horticulture suffered severe damage. Strawberry vegetation was quite prosperous, making the "Sendai strawberry" brand of Watari and Yamamoto of this area quite popular. However 90% of such planting areas suffered tsunami damage. Facilities such as vinyl houses, etc., were devastated and salt damage prevails. Furthermore, in coastal areas, some lands remain underwater (Photo 2), and other lands are in danger of submersion with tide level change, by ground subsidence accompanying the earthquake. This discourages life reconstruction and resumption of economic activity. For that reason, integrated group relocation for inhabitants near the shore to higher altitudes inland is in discussion in city planning intended for reconstruction. 4) Influence on the whole fishery has extended to damage of 500 billion yen in Iwate and Miyagi comprehensively. 5) Damage to agriculture overall amounts to 700 billion yen in Miyagi and Fukushima in total. 6) According to Kyodo News, April, 2, 2011.